It's the best cure for your 'Justice League' malaise. The animated Justice League: War is the dark DC Comics superhero team-up that you wanted when you stepped into the theater to see the mildly disappointing live-action Justice League. The good news is that you can rent or buy this better alternative via Amazon for under $10. Beat by beat, Justice League: War is remarkably similar to its live-action counterpart, but whereas the latter relies heavily on the previous movies leading up to it, the former functions as an exciting, standalone adventure. The plot will look remarkably similar: The League unites for the first time out of necessity to combat an invasion from Parademons hunting for some Mother Boxes. But were you underwhelmed by only five heroes that later get joined by a resurrected Superman? Good news: Justice League: War brings all the same characters (minus Aquaman) together with Shazam and Green Lantern. Amazingly enough, the movie isn’t burdened by having more characters to deal with, and it even carries with it some entertaining fights between the heroes. When it all starts, none of these heroes have any pre-existing friendships. As Parademons begin abducting people around the world, each is drawn into combatting the alien invasion on their own turf. Inevitably, this leads to a series of awesome confrontations before they band together: Batman vs. Green Lantern, Superman vs. Batman and Green Lantern, and more. Watching these heroes come together to fight for the side of good is thrilling to watch in a way that Justice League lazily never achieves. Yeah, the villain Darkseid here is nearly identical to Steppenwolf, but he feels more threatening and genuinely “better” than Steppenwolf ever did. This Justice League doesn’t need a version of The Flash that’s doing his best “Tom Holland as Peter Parker” impression because The Flash is fine as the gallant speedster he is in the DC Animated Universe. We get all the comedy we need from the film’s Green Lantern who’s so full of piss and vinegar that he’s easily the most entertaining thing in the whole movie. Another welcome focus for War is the young Billy Batson masquerading as Shazam, a hero we’ve yet to meet in the DCEU. He’s at once one of the team’s most powerful members, but because he’s a literal child, his genuine youthful exuberance shines, hilariously confusing everyone else. We can’t know for sure, but this Shazam feels like a relatively new hero. In a way, we watch this awesome spectacle of a movie unfold through his eyes. Despite the darker, apocalyptic story that includes its fair share of cuss words, Shazam’s personality brings with it a kind of welcome levity that balances out the tone of the movie. Superman is a paragon of excellence, and even when he’s fighting Batman or Green Lantern, he’s usually doing it with good intentions. Whereas Ben Affleck’s brooding Bruce Wayne miserably shambled his way through Justice League unable to compete with a Parademon, War’s Batman can hold his own in a fight while emerging much later as the group’s leader. Wonder Woman is a hilarious “fish out of water” and the team’s most efficient combatant, feeling more Amazon and less like she spent a century trying to fit in. Shazam might be one of the strongest, but he acts like an exuberant child constantly. 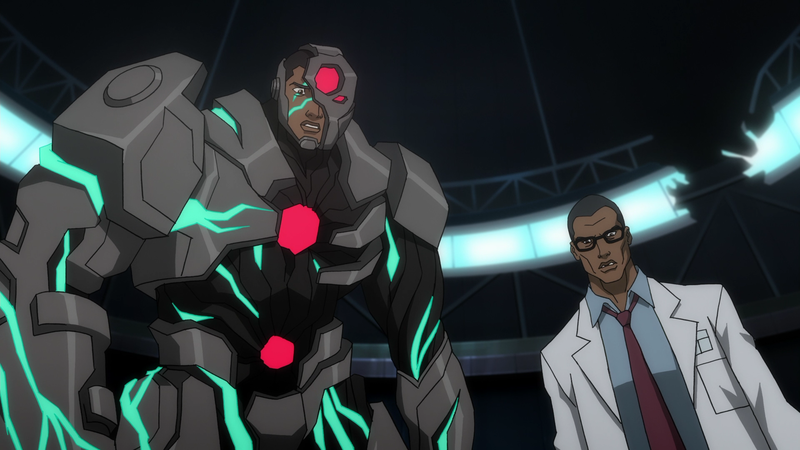 Justice League: War also successfully tells Cyborg’s origin story amidst the unfolding crisis, from start to finish. Victor Stone starts the movie literally playing football, and he goes from high-tech Frankenstein monster to fully-evolved hero in a well-paced arc that involves very little grumbling or grave-digging. The fact that the movie can do this in 79 minutes while showcasing six other heroes is damn impressive. Cyborg's dynamic with his father is identical, and his costume looks way cooler. Rent or buy Justice League: War from Amazon for under $10.